It’s my goal to ski and report on every ski mountain in New York. Given the demands of work, family, and our property near Gore, that may take a while. Until today, I’d never skied Windham Mountain in NY and it was a big gap in my resume. 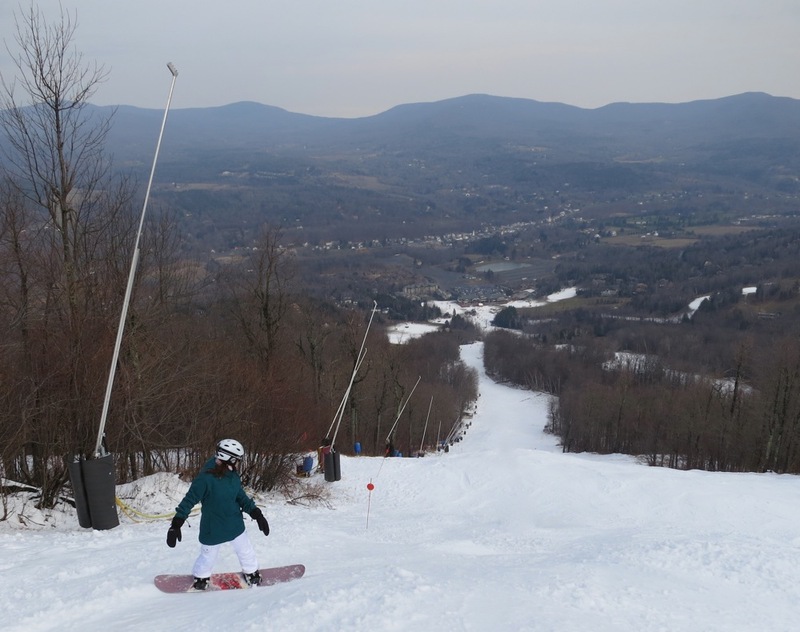 My plan was to ski Windham for the first time last Friday — the mountain’s planned opening day — but work didn’t cooperate. Today the stars finally aligned, and I got my chance. The forecast called for afternoon showers, so I left the flatlands well before dawn, to make the most of the morning. When I arrived at the mountain around 8:15 it was gray and warm. I grabbed a cubby in the main base lodge area and ordered breakfast. The resort feels very well cared for, and when you’re in the common areas, you do too. After chatting with the chef, I whirled around and somehow my egg sandwich ended up on the floor — it was replaced even before my embarrassment slipped away. I booted up and headed out to the Whirlwind Quad. There were two routes down, which was one more than other mountains managed to put together for opening weekend. The combination of Upper and Lower Whistler served intermediates and Upper/Lower Wolverine was for experts. Both were buried in deep layer of manmade snow that skied really well in the warm temps of the day. All the trails except “The Wall” had been groomed and surfaces were 100% carveable. At opening the trails were empty and I skied a couple runs on Whistler. On my third run I made my way to Wolverine and never left. The pitch and solitude were right up my alley. In the spring-like conditions, irregular bumps formed and I really got a workout. I spent most of the morning savoring the bumps on Upper and working on the Thousand Steps Drill on Lower. After a quick break for lunch the sun poked out and things got even softer. Two more runs on Wolverine and my early season legs were pretty tired, so I took my time, skiing a few more runs on Whistler. 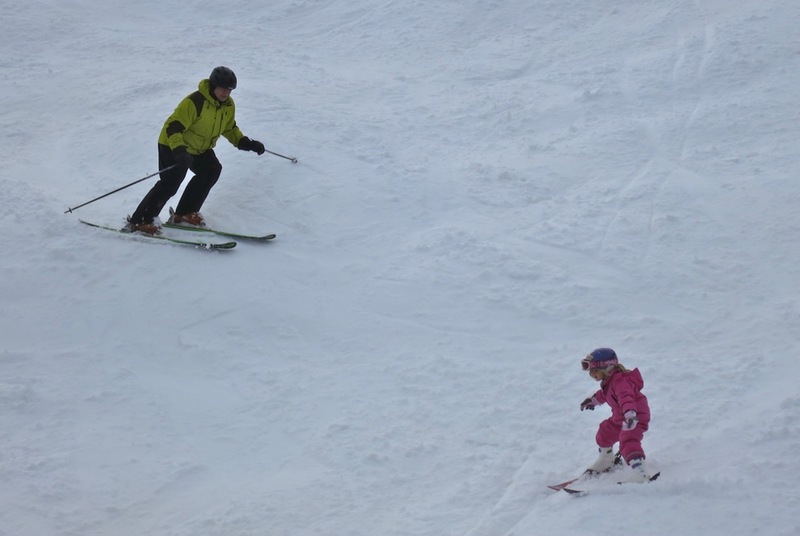 I give the skier of the day award to Gracie, a three-year old who didn’t seem equipped with the skills to handle the heavy corn snow and bumps, but skied all day with her dad. I lasted until about 3pm and by that time, most skiers had retired to the lodge or headed home. On my final approach to the cozy base area I couldn’t help feel that Windham is a little different from other mountains that I’ve skied in New York. If Windham’s goal is to create a lifestyle, I’d say they are succeeding. They’re building a ski community or even a club and the members seems to like it quite a bit. I got what I was after too: a new experience at a friendly place, and a dozen laps on a steep run with some lusciously soft bumps. That really does sum up the Windham experience pretty well. How were the lines, manageable? I for one always preferred the terrain of Windham to Belleyare: more variety. And I have always preferred it’s quieter nature to the craziness of Hunter. However, here is the part about Windham’s management that you probably would not be too happy about. Windham doesn’t like Belleyare…in any way. 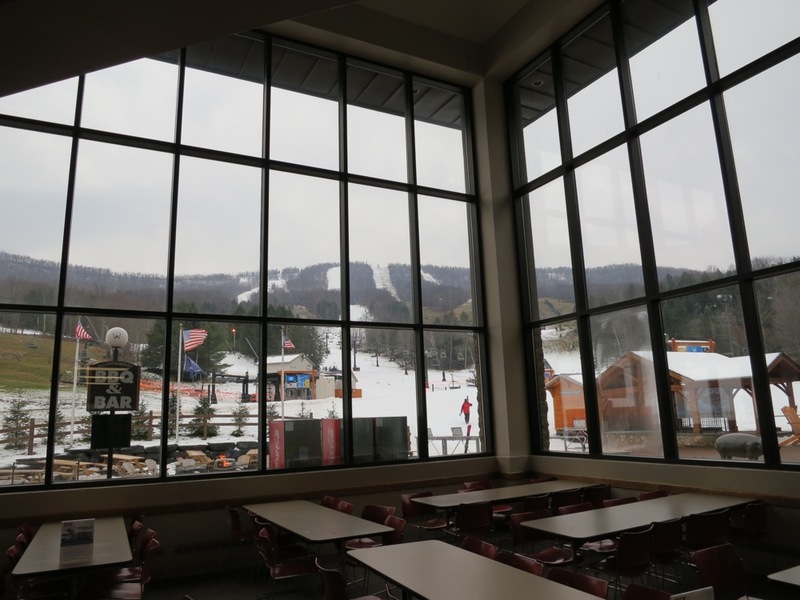 Privately owned Windham Mountain opposes expansion, development, and continued existence of publicly owned Belleayre Ski Center. This is because Belleayre is able to charge a lower price for their tickets due to their public financing. 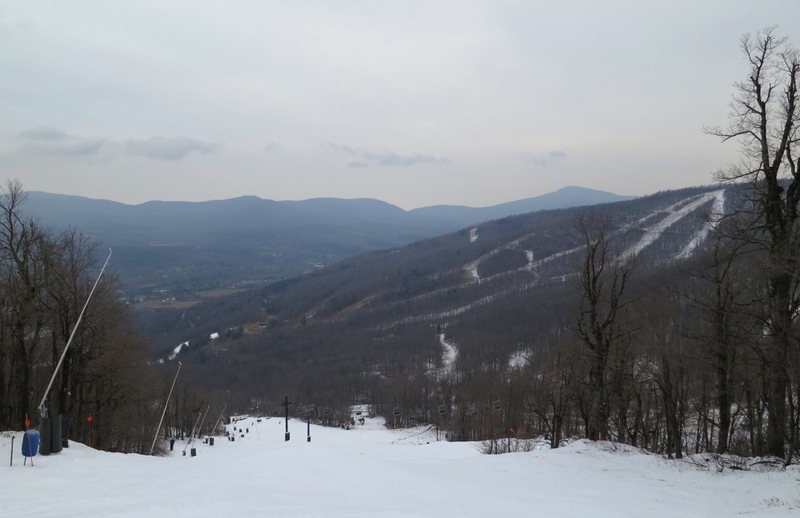 Windham and Hunter Mountains, in Greene County, both have expressed the sentiment that they are unable to compete with Belleayre, and that it should not be allowed to be publicly financed. I almost went to Windham Saturday. I’ve been getting vouchers through the Warren Miller movies the last couple years, and haven’t gotten around to using them. I really like the East Lift, it’s a detachable mid-mountain quad. During the week I’ve never waited, it’s always ski right onto the chair. It covers probably the same vertical as my home hill, Greek Peak, and is about half the time on the chair. Some nice trails off that lift too. Glad you finally got to ski there, it’s not as bad as some make it out to be. 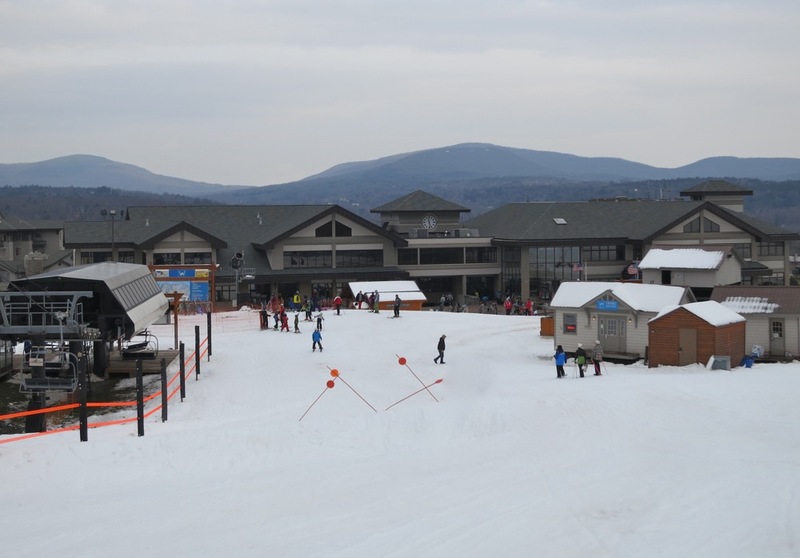 Windham is my favorite of the Catskill ski areas (I have not been to Plattekill). Much more relaxing than Hunter and the skiing is better in my opinion. Good venue for PSIA events which is usually what brought me there. Did you notice that every trail starts with W? Gosh Harv, I woulda joined you had I known you were going. I had enough of Greek Peak’s 1 run, and I have a free pass for Windham from the Warren Miller flick. Let me know if you go there again. I can use my pass before Xmas. There are definitely reasons to go back to Windham, Harvey, it’s not a one and done. The trail pod on the left has some great terrain, and there is the natural bump run all the way over on the right…. 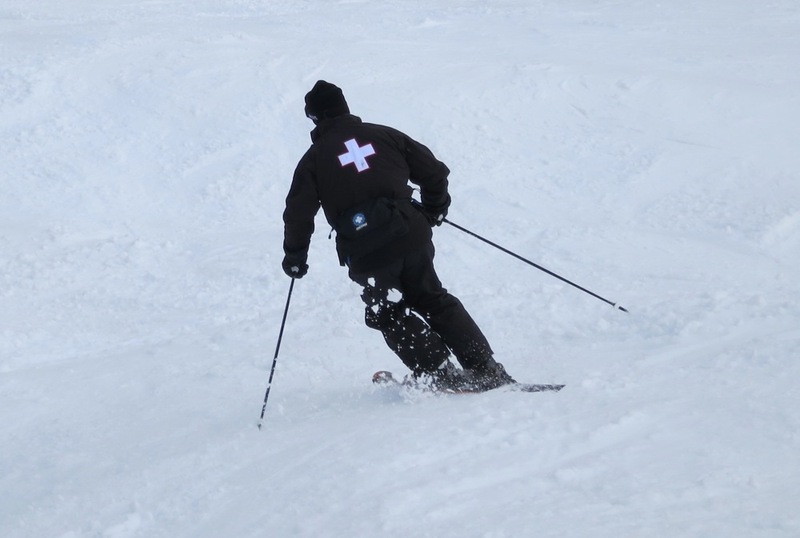 Also there are some great people on Patrol there to meet and ski with! The closest I’ve been to Windham was driving by on my way to Mtn. Jam at Hunter. It’s been on the fringes of my ski radar for a few years now. I’ll have to make a better effort to get there this season. Did you know that Windham opened as a private club in the 60’s? I don’t think it opened to the public until the late 70’s. I had a truly epic Nor’easter powder day there March late 80’s. 15″ at opening, doubled by closing. Steady 30+ wind all day. Lapped that trail skiers left of original chair, every run filled in smooth! Lost a ski, but that’s another story. Somehow it makes sense that Windham was started as a club. I wonder what other NY mountains started that way. I think Hickory may have. Not sure that Wikipedia is really any kind of authority, but for the record, I’m another one who is firmly against public funds being used to undercut private enterprise in the ski business or any other industry. I’m pretty confident that the owners of Hunter, Windham and Plattekill are in agreement on that point. I remember way back when West Mountain filed a lawsuit against New York State and Gore Mountain based on this. Windham is a fun mountain, the East peak’s trail Worldcup (wedgie) is my favorite. In the Spring The kids and I will lap Wedgie to the Little terrain park right back to the EPQuad all day. Also in the spring they keep all the trails open so its fun navigating around the bare spots and grass skiing. Yes, it was in the mid 1970’s when West took on Gore in the courts over this very issue. Gore had been charging $12 a day for an adult lift ticket, $8 for a child and teen ticket, when Stratton and Bromley were already around $20 (which felt like a fortune at the time). Still have my old Gore tickets in case you were wondering. West said it couldn’t stay in business if Gore, at 4 times its size, charged less. It was all settled, I recall, when The Department of Environmental Conservation agreed to raise Gore and Whiteface prices to market rates. My Dad refused to ever ski West again after that. PS: 2000 Year Old Skier: Good to see someone on HR older than me. Started my ski season at Windham at least 5 times. Little Irish hotel at the bottom. Check if rooms are available, but don’t book. Rather, stay, drink, eat..then ask for his best rate before he closes. Oh-YEAH. If Gore’s rates were below “market” and losses were being subsidized by the taxpayers, then the DEC had no case. It’s bad policy to run “tax positive” enterprises out of business and replace them with those supported by tax dollars. Further, it just ain’t right. The state played hardball with Harvey Mountain and drove them NELSAP. Windham’s other amenities should not go without mention.. There is a fantastic brewpub in town serving great burgers and beer flights of their own beer, locals just called it “the brewpub”. Lots of great lodging options, restaurants, and country charm. Hunter has good skiing, but they don’t come close to Windham’s food options. Sounds great, made me wish I skied alpine. One of the big disadvantages of skiing cross country is the dearth of pre Christmas skiing options in the northeast. How do you spell global warming again? Windham has become my favorite place to ski in the Catskills over the last few years. It’s an easy drive, without a lot of twists and turns in the road. There are plenty of things to do on days where the conditions are iffy. Variety of terrain for myself, stepdaughter and her friends. Lots of food options and apres ski family fun. The grooming is typically good to great, and trail variety has enough to keep us all coming back. Vielka – I think that Windham would be a good fit for you. 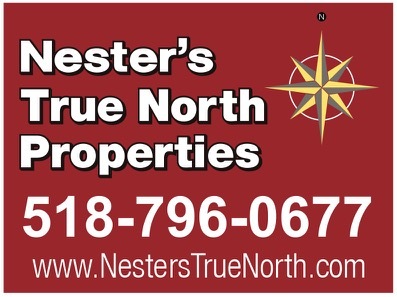 Maybe call them up and see if they can help you out, or check out vrbo / homeaway / airbnb for a condo. The rest will fall into place I’m sure. Have a fun trip. Windham was my first real mountain that I ever rode a snowboard down, and no matter where else I ride, I think it will always be my favorite place. It’s not overwhelmingly big but it still never gets boring. The staff members are all so great and the resort is beautiful! Also the town itself is a great place to be, with friendly people in the shops and awesome restaurants. I make the drive up whenever possible because it is always a guaranteed great time. For my money Windham has the best snow when we get dumped on with powder. Not sure why but it seems like the mountain is just faced perfectly so that the winds don’t take all the top powder away (Jiminy) and yet still keeps those NYC/CT jerks away (Hunter). Weekends are murder no matter what but at least the snow there makes it enjoyable. Just get there early. Only complaint is their lack of space to change clothes in the lodge, but they have an awesome equipment storage outside for those ski&snowboard nerds like me. WHY NOT WHEEL yourself over to WINDHAM where you can ski like a WOLVERINE on the WARPATH with a WEDGIE until they WHEEL you on the WAY OUT in a WHEELCHAIR with the rest of the WICKED WISEACRES.